Using their popular Chrome and Firefox browsers, Google and Mozilla are pushing for all web site owners that collect information from customers on their web sites to secure their sites with SSL encryption. This is the “encrypted / secured” lock in the browser address bar which signifies a web page is secured over the https:// protocol. When a web page is served over https:// all data between the server and the end user’s browser is encrypted and can’t be read. Traditionally web pages and enquiry forms were often not encrypted and only shopping cart web sites that collected credit card information were required to have SSL and https:// encryption. Previously no one gave much thought to encryption of a web page unless they were shopping online. Browser warnings were minimal about page security. That is all going to change and has already started as of the 1st of October, 2017. Web sites that have login forms or collect information online that do not have https:// and SSL encryption will have a NOT SECURE warning displayed to their users. The long term plan is to progressively make these warnings more prominent with the goal of having all web pages that collect information or pass user data online to be encrypted. WHAT DOES SSL and HTTPS:// ENCRYPTION COST? 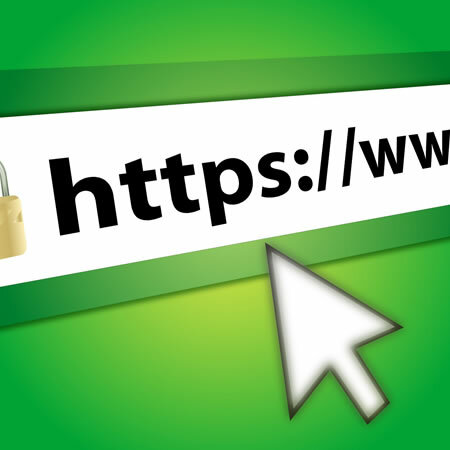 Depending on your hosting provider, securing your site with HTTPS:// SSL can cost upward of $100+ per year. Some providers (including Cyanweb Solutions’ business grade hosting services) can provide free “shared SSL” certificates to clients. What type of SSL certificate you need will depend on your specific requirements and purpose of the SSL cert. If you would like to secure your business site or communications with SSL, talk to us – we are here to help.